alaTest har samlat in och analyserat 5 tester för Waring Pro WTO150 4-Slice Toaster Oven with Built-In 2-Slice Toaster. Det genomsnittliga betyget av denna produkt är 5.0/5, att jämföra med genomsnittsbetyget 4.5/5 för produkter i samma kategori. So easy to use and clean. Cooks everything evenly. 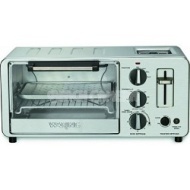 Bought this product to replace a toster and toaster oven. Takes up less room than 2 appliances. Very easy to clean with the pull out trays under each section. Extremely easy to operate and understand. We love the toaster feature. It allows the use of a toaster when needed without the use of more counter space. It is so compact. great product! Toaster ovens never toast properly. Having a separate toaster is a great feature.